For anyone who thinks that the granular, old-fashioned neighborhoods of Lower Manhattan — the kind with ice cream parlors, stoops, barber shops, bars and tattoo joints — are fast decamping to Brooklyn, head on over to one of the area’s incandescent holdouts, the East Village, where the new walk-in Swiss Institute has just opened on one of the city’s liveliest streets, St. Marks Place. 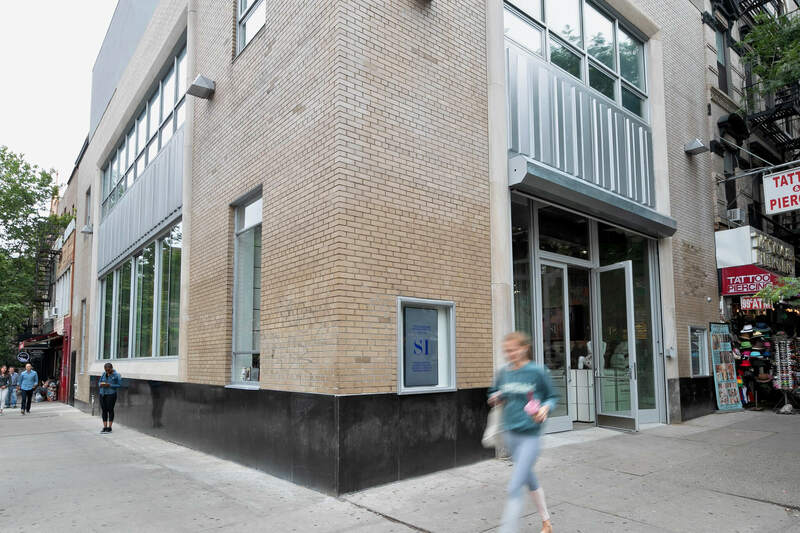 Perhaps you don’t know that the Swiss Institute has been around since 1986, a nonprofit art-world secret housed in various low-profile Manhattan venues. Since 1994, it occupied locations in SoHo but became isolated as high-end boutiques swamped the neighborhood and artists exited. The Swiss Institute wanted to relocate to a neighborhood where its forward-thinking mission would resonate. Led by Simon Castets, the French-born director and curator, the Institute found a high-visibility corner and a built-in audience in the thick of the pulsing, gritty, diverse East Village. The Institute is free, friendly and breezy, a corner museum — like a corner deli or drugstore — dedicated to experimental work by emerging artists. The modest two-story, 1950s building used to be a neighborhood bank, and it still looks it, blending right into a raucous, fine-grained urban melee that would gladden the heart of Jane Jacobs. With educational outreach programs, an open-door policy, and an inaugural show — “Readymades Belong to Everyone” — the Institute adds energy and edge to a neighborhood that it clearly gets and supports. It’s chill. Sensitively restored on the outside and repurposed in spanking white on the inside by Selldorf Architects of New York, the cleaned-up, handsome-but-not-fancy, 7,500-square foot building fits right into the neighborhood.It wears the former bank building like camouflage. It’s a reappropriated ready-made. Squint and you can’t tell that there’s much difference between the Institute’s funky, un-precious inaugural show, and the 24-hour T-shirts-and-everything-else emporium across the street. On two floors of the Institute, plus the basement and rooftop, the show updates the idea of Marcel Duchamp’s “Fountain” — his signed, pedestalized urinal of 1917 — using images of buildings or designed objects as ready-mades. The young Swiss curators Niels Olsen and Fredi Fischli invited 60 artists and architects to interpret street signs, chairs, teakettles and architecture. At the entrance, you step through “Gate,” a common airport security gate with graffiti slapped on its sides by Reena Spaulings (who is actually an anonymous, mash-up New York persona, sort of an art-world avatar). In this context, we notice another artifact of our culture that we take for granted. Three steps away, “Fire,” a tall, free-standing billboard depicting a fire truck, by the New York artist Lutz Bacher (a pseudonym), could be the image of the fire truck passing by just outside the window, siren wailing — again something we no longer really see even if we hear it. Next to it, the British artist-filmmakers Oliver Payne and Nick Relph appropriated Duchamp’s first ready-made, “Bicycle Wheel” (1913), using instead a high-performance Aerospoke bicycle wheel. What’s changed since Duchamp, of course, is that the displaced object is no longer just industrial, as artists including Robert Gober, Damien Hirst, Tracey Emin, Michael Landy and Gabriel Orozco have long shown. The deceptively simple works at the Swiss Institute owe a considerable debt to Mr. Gober, an American sculptor, who simultaneously recognized and rejected the industrial ready-made using hanging sinks, playpens, beds and doors (before he moved, in the 1990s, into environments). Many of the ready-mades here are domestic, like the old bathtub, complete with Rorschach rust stains, that the Los Angeles artist and poet Ser Serpas hangs up in the corner. There are familiar names. We find the famous, striped Aldo Rossi changing cabana (1980), plucked off Italian beaches and intended as a wardrobe. Petra Blaisse, the Dutch designer, hangs (and signs) a floor-to-ceiling Bubble Wrap curtain (“Don’t Pinch!”), while her Dutch design colleague, the architect Rem Koolhaas, sent in slides of the Berlin Wall from an architecture school project (“Field Trip, 1971”): his long, typed, amusing narrative points out the apparent irony that this walled city was a prison of freedom, and East Berliners wanted in. The Chilean poet-architect Smiljan Radic sent one of the very few flesh-and-blood objects, a Dada-esque collage of a violin bow suspending part of a violin’s belly on strands of its horsehair. The bow teeter-totters delicately over two large industrial light bulbs planted in a crude wooden bowl. The curators have cast a wide net in local, international and underground communities to find artists, including street artists, known for rephrasing objects in distortional ways. The rows of logo T-shirts on boxes lined up against the wall, by the London-based artists Richard Sides and Gili Tal, are just like the T-shirts you’ll find outside, rewritten with an anarchic twist: “Vote Acid,” reads one. Those shopping bags on the floor, sent by the German artist Maria Eichhorn, are filled with empty tea boxes, plastic water bottles, and chewing gum wrappers discarded by people installing the show, a kind of behind-the-scenes gallery diary. Many of the 65 exhibits are art-referential pieces, art about art, and you start consulting the exhibition menu for clues to understanding them. But after a while, you get into the rhythm of trusting your eye and instincts. You notice that in “Maso Chair,” the subversive Swiss architects Trix and Robert Haussmann replaced the gaskets on the metal frame of an Eames chair with flower studs used to support floral arrangements — ouch! And isn’t that contorted steel tube that the New York artist Wade Guyton twisted up into the air the remnant of the iconic 1920s Breuer chair? These ready-mades are not beautiful, signature originals with a strong physical presence, but artworks that critique formal art. You have to get rid of that nasty notion that “I could have done this,” or, rather, you gradually understand that you actually could do this, at home, tonight. Your perception shifts. Pleasantly and unexpectedly brainwashed, you walk back out to St. Marks Place and gaze at the T-shirts and hats and hookah pipes and think about signing them. Somehow you hear the rumble of motorcycles with a new interest and curiosity: it’s a John Cage cantata. Even the lively St. Marks Place feels more alive. Life is art and art, life. Dada rules.